Widespread skyfall for the UK but how much for Reigate? The worst of the snow on Friday is reserved for places like Wales near the leading edge of occluded fronts associated with the LOW which will slowly creep off (called a “slider low”) to the South East, unable to make headway against that brutish HIGH over Scandinavia! This HIGH isn’t budging and has stopped the LOW zipping right over the UK which would have delivered mild air from the Atlantic. Mild air probably won’t reach the SE for at least a week so any snowfall will stick around. 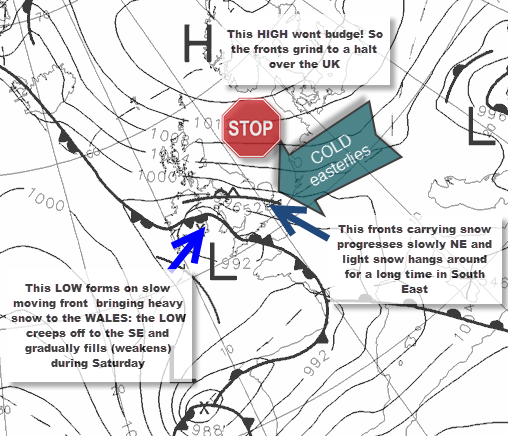 The problem for Reigate tomorrow is that fronts edging slowly east (and weakening as they edge into higher pressure) will slow right down and bring persistent light snow most of the day and through to Saturday. Snow could be heavier at midday for a while on Friday. Starting around 8-9am in Reigate light snow will accompany very cold South Easterly winds of up to 20mph and gusting over 25mph, giving a severe windchill of -8°C. Given the very low temperatures the snow will be dry and might blow around a bit in exposed areas. Nevertheless, total snowfall should be quite low but spread out over a long period: by end of Friday possibly around 8cm for Reigate, which isn’t a show-stopper… or wouldn’t be in Sweden! Saturday sees more snow and cold, more on that later. So … will we see the SKYFALL in Reigate tomorrow and over the weekend?! … hopefully not but it will be very cold, windy and snowy, so wrap up and enjoy! Spare a thought for Wales and the west where there will be REAL BLIZZARDS. (Video shows rain and snow (hatched) from Friday am through to Sunday in 3 hour intervals).